In the domain administration homepage, you can configure and manage domain-level settings. 2. Open the Administration menu. 4. At the top right, select Domain administration. To complete these steps you must have the Smartbar extension installed. Learn more: Install the AODocs Smartbar. 1. From Google Drive, open the AODocs settings menu. 2. Select Domain administration. 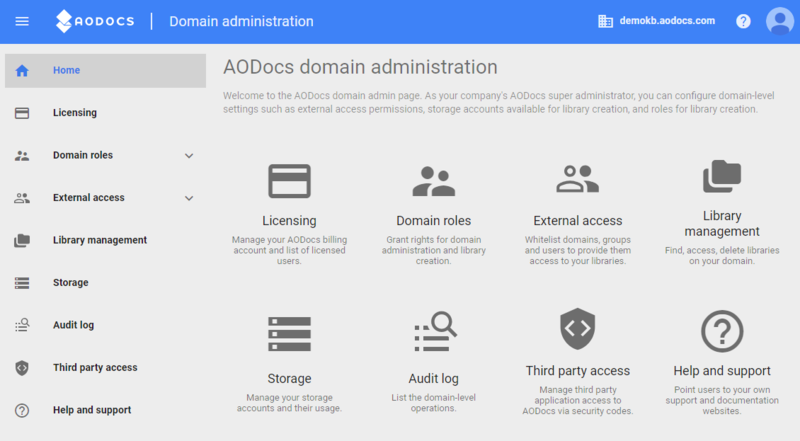 The Domain administration opens in the AODocs interface. Help and Support: Customize the Help and support URLs with your own documentation. Learn more: Overview of the domain administration homepage.